About one-third into the shortened NHL season, enough games have been played to have a good idea who the leading candidates are for the top rookie in the NHL. This season, as opposed to recent years, there is no clear-cut candidate to win the Calder Trophy, but rather a plethora of worthy candidates to consider for the prized hardware. While some of the candidates are hyped draft picks, other are undrafted players that are coming out of nowhere. After a very slow start, Granlund, a Calder-trophy favorite, has picked three assists in his last three games even though he played a season low 8:26 on Sunday against the Detroit Red Wings. On the season, the Finn has only recorded 1 goal and 5 assists for 6 points in 14 contests to go along a -2 plus/minus rating, getting 14:40 minutes of ice time on average. After an impressive 13 points in 14 games last season with Buffalo, expectations were high for Foligno this season. The rugged winger is off to a good start for the Sabres, even though he has found the back of the net only once this year. With 1 goal and 7 assists for 8 points in 16 games to go along with a disappointing -5 rating, Foligno will need to step his game a notch to contend for the Calder. Signed as a free agent over the summer by the Oilers, Schultz is the leader among rookies in ice time per game with 22:55. The puck-moving defenseman has been the cornerstone of a rejuvenated power-play, scoring all of his goals on the man-advantage. Through 14 games, Schultz has 4 goals and 3 assists for 7 points with 36 shots, tied with Jakob Silfverberg for first among rookies. A pre-season Calder favorite, Huberdeau began his NHL career with a 3-point night in the home opener. 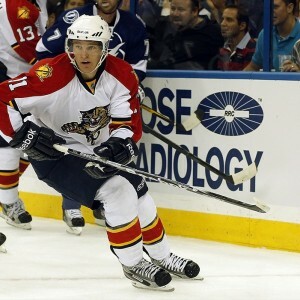 While he has slowed down for the struggling Panthers, Huberdeau has 6 goals and 3 assists for 9 points in 14 contests. 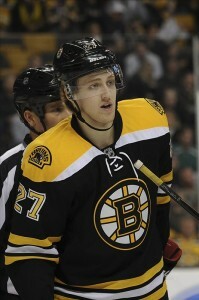 Look for his production to increase when Kris Versteeg and Scottie Upshall come back from their injuries. The undrafted Conacher who won the playoff MVP award and a Calder Cup with the Norfolk Admirals of the AHL last season, came out of the gate fast notching 5 goals and 7 assists for 12 points in his first 7 games. Since then, he has gone colder than Arctic ice, recording only one helper while posting a -7 rating in his last 7 games. Overall, he is still the point leader among rookies with 13 points in 14 games for the Bolt. The speedy Russian made a big impact very early for the Blues, recording five points in his first two games. Save for a stretch of four games during which Tarasenko was blanked and posted a -9 differential, he has been playing well on a line with Alexander Steen and Andy McDonald. The 21 year-old Tarasenko is only one point behind Conacher with 6 goals and 6 assists for 12 points in 15 games. Please note that goaltender Viktor Fasth of the Anaheim Ducks is too old to be considered a rookie as he is 30 years of age.